Hailing from the nether regions of the mainland of the U.S.A. I often keep my mouth shut and eyes open, over ten years in this profession, with nothing to show for it but a good set of true friends and memories to last a lifetime... Tattoo Shop Proprietor, Artisan, Enthusiast, & nerd. Last weekend in San Angelo, Texas, a small town in the center of western Texas where the trees don’t get much taller then six feet, and there is probably more livestock then people, some world class tattoo artists converged to offer the locals a chance to get something from outside their local community. The show is put on by two brothers in town, Alex and Aubrey Trufant, they also have a shop and both tattoo full time, they are not some production company looking to cash in. It wasn’t a huge show, it was just right, not so busy that we had to turn anyone away, but busy enough to still be tired when the floor was closed each night. Bottom Line: it was a good show. Each day food was brought in to an “Artist Only Area” so everyone could grab a bite to eat of something not concession stand made. There were after parties each nite, and get togethers pre and post show to say thanks for coming out…. 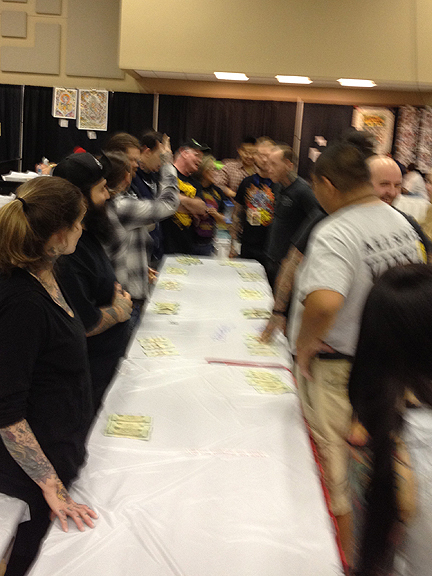 Our booth was situated around some all out badasses: Tony Hundahl, Grant Cobb, Casey Corklic, Anthony Montemajor, Matt Arriola, Daniel Albrigo, Inkmasters, and Texas’ very own Oliver Peck, and Florida’s very own Mike Wilson. There were a lot of Texas native and Border State Shops representing…As well as a group of guys that tattoo and put on the Rome convention. I didn’t get to walk around too much, as I was either running around taking care of errands, or busy helping in the booth. We had a good weekend, albeit the rocky start we had getting there. I took a few photos from the event, but nothing too epic by Texan Measure… It was nice to finally get to meet Albrigo, and Arriola, as I have been a fan for a while. And as with most shows Oliver attends it all wrapped up with a game of C-Lo, and Oliver didn’t win this time, Arriola did… It was a good time.